A three-judge panel at the U.S. District Court in Baltimore overturned just the Western Maryland district, but the rest of the map could change, too. The commission plans to submit a proposed map to the General Assembly by April 2, one week before the end of the legislative session. Senate President Mike Miller has said he won’t consider a new map or changes to the redistricting process until the Supreme Court weighs in. 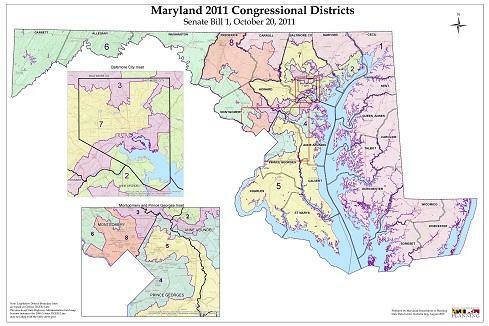 A federal court in Baltimore threw out Maryland’s congressional district map on Wednesday as unconstitutional. The three-judge panel gave state lawmakers until March to submit new districts. Gov. Larry Hogan is again pushing for Maryland to change how it draws legislative districts. For the last two years, Hogan’s redistricting bill has died in committee. Democrats say they don’t want Maryland to give up Democratic seats in Congress without other states giving up Republican seats. Maryland Democrats in Washington are proposing competing bills with the same purpose; overhauling how the nation’s congressional districts are drawn. Freshman Congressman Jamie Raskin has introduced a bill that would set up independent commissions to draw congressional districts. "You know if your car isn’t working right, you don’t need a new message, you need a new car," he says. "And if your engine’s not working, you don’t need a new message you need a new engine. And American democracy needs a new engine."